FOR LAMBS & SHEEP: For the prevention of coccidiosis in young sheep caused by Eimera bakuensis and Eimeria crandallis, Eimeria ovinoidalis and Eimeria parva. 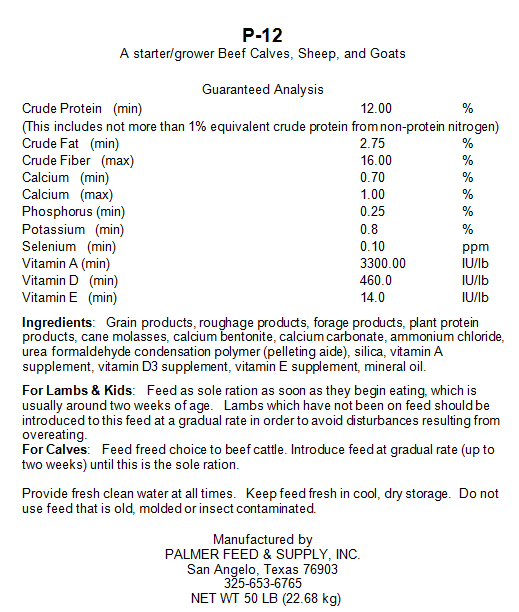 Ingredients: Grain products, roughage products, plant protein products, forage products, beet pulp, cane molasses, calcium carbonate, ammonium chloride, dicalcium phosphate, monocalcium phosphate, salt, saccharomyces yeast, potassium chloride, magnesium oxide, vegetable oil, vitamin A supplement, vitamin D3 supplement, vitamin E supplement, mineral oil, dried streptococcus faecium fermentation product, dried lactobacillus acidophilus fermentation product, dried aspergillus niger fermentation extract, dried aspergillus oryzae fermentation extract, dried bacillus subtilis fermentation extract, beta glucan (encapsulationg agent), soybean oil, lecithin, silicon dioxide, selenium, red iron oxide. 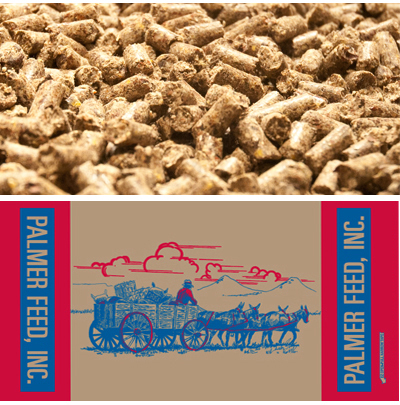 Feed at a rate of 3 to 4% per of the animal’s body weight/day. This ration contains 13.6 mg of Decoquinate per lb. Dose rate for Decoquinate is 22.7 mg decoquinate per 100 lbs of body weight. Feed for at least 28 days during periods of exposure to coccidiosis or when it is likely to be a hazard. Provide hay or roughage as needed. Provide fresh clean water at all times.Warning: Do not feed to animals producing milk for human consumption. stomum dentatum, O. quadrispinulatum), Small stomach worms (Hyostrongylus rubidus), adult and larvae (L2, L3, L4 stages-intestinal mucosal forms), Whipworms (Trichuris suis), Kidneyworms: adult and larvae (Stephanurus dentatus). For the removal and control of small stomach worms (Trichostronguylus spp), threadnecked intestinal worms (Nematodirus spp), barberpole worms (Haemonchus spp), and whipworms (Trichuris spp). Ingredients: Grain products, processed grain by-products, roughage products, cane molasses, calcium bentonite, calcium carbonate, salt, urea formaldehyde condensation polymer (pelleting aide), silica, vitamin A supplement, vitamin D3 supplement, vitamin E supplement, mineral oil. (4.08 mg fenbendazole per lb body weight) over a period of 3 to 12 days. Example: Feed 1 lb. 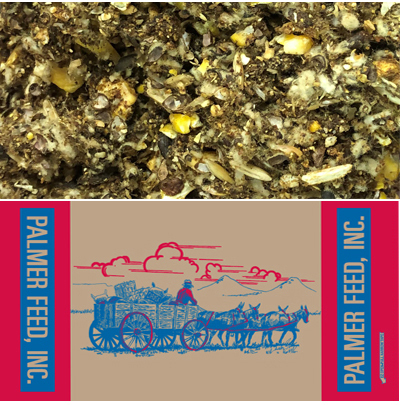 of medicated feed for each 100 lbs of body weight for 3 days to provide a total of 9 mg per kg body weight. LIMITATIONS: Feed as sole ration for a period of 3 to 12 days in order to provide a total intake of 9 mg per kg body weight. No withdrawal time needed. Under conditions of continued parasite exposure, retreatment maybe needed after 4–6 weeks. 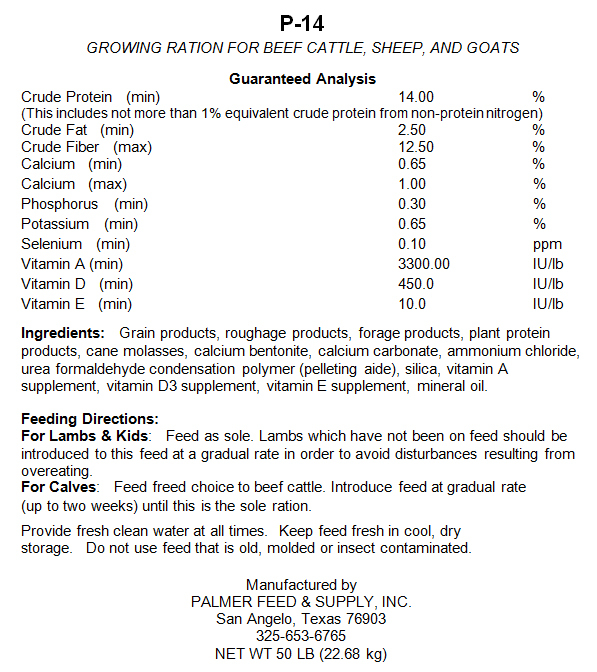 PALMER'S 14% SHEEP & GOAT SPECTACULAR 5/32"
Nutritionally balanced to ensure peak growth and performance. Highly palatable to increased consumption and maximum growth. Fortified with Vitamins and Trace Minerals. Contains ammonium chloride for prevention on urinary calculi. Made with CitriStim, which is a yeast product that has been shown to decease the population of pathogenic bacteria (including E. coli, Salmonella, Proteus, Klebsiella and Clostridium). Medicated with Deccox for prevention of coccidiosis. For goats: For prevention of coccidiosis in young goats caused by EIMERIA CHRISTENSENI and EIMERIA NINAKOHLYAKIMOVAE. 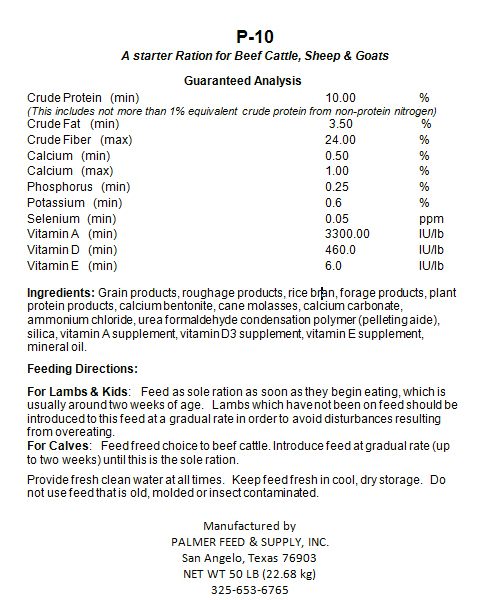 Ingredients:Grain products, forage products, roughage products, plant protein products, cane molasses, dried whey protein concentrate, dried skimmed milk, dried milk protein, soy flour, animal fat (preserved with ethoxyquin), lecithin, dicalcium phosphate, calcium carbonate, vitamin A acetate, vitamin D3 supplement, vitamin E supplement, thiamine mononitrate, pyridoxine hydrochloride, folic acid, vitamin B12 supplement, choline chloride, calcium silicate, manganese sulfate, zinc sulfate,copper sulfate, cobalt sulfate, ethylenediamine dihydriodide, sodium selenite,magnesium oxide, potassium chloride, sodium chloride, vegetable oil refinery lipid (feed grade), sulfuric acid, phosphoric acid, natural flavoring, artificial flavoring,propionic acid, sodium benzoate, mineral oil, ammonium chloride, selenium, red iron oxide, degummmed soybean oil, ethoxyquin (preservative), corn meal, silicon dioxide, monocalcium phosphate, selenium, linseed meal solvent, dried streptococcus faecium fermentation product, dried lactobacillus acidophilus fermentation product, yeast culture (live saccharomyces cerevisiae grown on a media of ground yellow corn, diastatic malt and cane molasses), dried aspergillus niger fermentation extract,dried aspergillus oryzae fermentation extract,dried bacillus subtilis fermentation extract, beta glucan (encapsulationg agent), manganesemethionine, zinc methionine, corn gluten meal, distillers dried grains with solubles,menhaden fish meal, silica, flavor ingredients, butylated hydroxytolu, butylated hydroxytolune (a preservative), calcium bentonite, urea formaldehyde condensation polymer (pelleting aide), salt, dried aspergillus niger fermentation extract, extracted citrus acid presscake, manganese methionine, copper lysine, cobalt glucoheptonate. 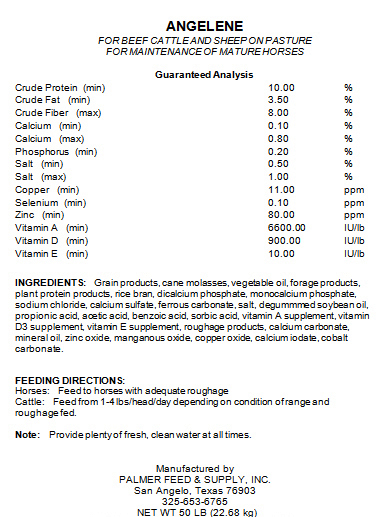 This ration contains 13.6 mg of Decoquinate per lb.Feed at a rate as indicated below to provide 22.7 mg decoquinate per 100 lbs of body weight. Feed for at least 28 days during periods of exposure to coccidiosis or when it is likely to be a hazard. Warning: Do not feed to animals producing milk for human consumption. For the prevention of coccidiosis in young goats caused by EIMERIA CHRISTENSEN and EIMERIA NINAKOHLYAKIMOVAE. Ingredients: Grain products, forage products, roughage products, plant protein products, cane molasses, rice bran, ammonium chloride, menhaden fish meal, calcium bentonite, calcium carbonate, salt, urea formaldehyde condensation polymer (pelleting aide), silica, vitamin A supplement, vitamin D3 supplement, vitamin E supplement, mineral oil, dried streptococcus faecium fermentation product, dried lactobacillus acidophilus fermentation product, yeast culture (live saccharomyces cerevisiae grown on a media of ground yellow corn, diastatic malt and cane molasses), dried aspergillus niger fermentation extract, dried aspergillus oryzae fermentation extract, dried bacillus subtilis fermentation extract, beta glucan (encapsulationg agent), decoquinate, corn meal, soybean oil, lecithin, silicon dioxide, ferrous carbonate, zinc oxide, manganous oxide, copper oxide, calcium iodate, cobalt carbonate, zinc methionine, manganese methionine, copper lysine, cobalt glucoheptonate, selenium, red iron oxide. Feed for at least 28 days during periods of exposure to coccidiosis or when it is likely to be a hazard. Warning: Do not feed to goats producing milk for food. In research trials, Ultra Fresh® Optimum lamb milk replacer delivered significant increases in average daily gain and lamb weaning weights. Fill your lambs with an efficient and effective fuel this lambing season and watch your flock pull out ahead. Doe’s Match® kid milk replacer is nutritionally complete, and specially formulated for the nutritional needs of kids. It’s a new high protein 25/28 blend which also includes the Architect®Formulation System, a unique combination of protein, fat and carbohydrates that helps to grow bigger, more vigorous kids. In research trials, kids raised on Doe’s Match® Premium Blend Kid Milk Replacer cost $0.16 less per pound of gain than those raised on goat’s milk. And unlike traditional products, kids raised on Doe’s Match® had less scours than those raised on goat’s milk. With Land O’Lakes® Doe’s Match® Premium Blend Kid Milk Replacer, you spend less – goats grow more. It’s that simple. So get going. Get those kids growing with Land O’Lakes® Doe’s Match® Premium Blend Kid Milk Replacer. Specially formulated for kids with fully digestible nutrients. The 25% all-milk protein provides the optimum replacement for mother's milk. The 28% fat level is homogenized to minute particle size for fuller digestion. Fast growth results from the high energy levels that are easily digested. The extra fortification of vitamins and minerals provides optimum growth and aids in disease prevention. Eliminates the possible infection transmitted by goat's milk that causes caprine arthritis encephalitis (CAE). 37% ALL NATURAL RANGE CUBE 1/2"